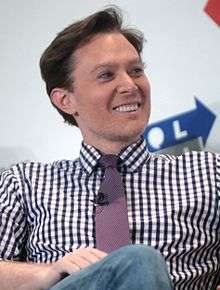 Clay Aiken (born Clayton Holmes Grissom; November 30, 1978) is an American singer, songwriter, television personality, actor, author, politician and activist. Aiken was the 2014 Democratic nominee in the North Carolina 2nd congressional district election. Aiken began his rise to fame placing second on the second season of the television program American Idol in 2003. He and the 2003 Winner Ruben Studdard were both offered recording contracts by RCA Records, and his multi-platinum debut album Measure of a Man was released in October 2003. He released four more albums on the RCA label: Merry Christmas with Love (2004), A Thousand Different Ways (2006), and the Christmas EP, All is Well (2006). His fourth studio album (the first album of original material since 2003's Measure of a Man), On My Way Here was released on May 6, 2008. After the release of On My Way Here, Aiken left RCA and later signed with Decca Records. His first album with Decca, Tried and True, was released June 1, 2010, and his second Steadfast, was released March 26, 2012. In the years following his American Idol appearance, Aiken has launched eleven tours, authored a New York Times best-selling book Learning to Sing: Hearing the Music in Your Life with Allison Glock, and was the executive producer for a 2004 televised Christmas special, A Clay Aiken Christmas and his televised live concert special in 2010 on PBS Tried & True Live!. He has been a frequent talk show guest, particularly on The Tonight Show and Jimmy Kimmel Live!. He appeared as a guest star on Scrubs, Drop Dead Diva, 30 Rock and participated in comedy skits on numerous other shows. He also competed in the fifth season of The Celebrity Apprentice and placed second in the finals to Arsenio Hall. Aiken created the National Inclusion Project (formerly the Bubel/Aiken Foundation) in 2003, accepted a UNICEF ambassadorship in 2004, a position he held for 9 1/2 years until 2013 when he gave it up in order to run for Congress. He was the "UNICEF Ambassador of Education for All Children Worldwide"; he traveled extensively on their behalf in this role. In 2006 was appointed for a two-year term to the Presidential Committee for People with Intellectual Disabilities. In 2014, Aiken announced his intentions to run for Congress in North Carolina's 2nd congressional district. He won the Democratic primary held on May 6, 2014, but lost to Republican incumbent Renee Ellmers in the general election on November 4, 2014. Clay Aiken was born and raised in Raleigh, North Carolina. As a young boy, Aiken sang in the Raleigh Boychoir; and, as a teenager, he sang in school choirs, church choir, musicals and local theatre productions. After high school, he sang lead with a local band, Just By Chance, co-hosting and performing with the band at "Just by Chance and Friends" shows in Dunn, North Carolina. He was also MC and performer at the Johnston Community College Country Showcase in Smithfield and at the North Carolina Music Connection and Hometown Music Connection shows in Garner, and Benson. He performed the national anthem numerous times for the Raleigh IceCaps and the Carolina Hurricanes hockey teams, and performed it at the 2011 NHL All-Star Game at the RBC Center in Raleigh. Three demo albums of Aiken's vocals were created before American Idol with the aid of studio time given as a birthday gift by his mother: a cassette called Look What Love Has Done (by Clayton Grissom), a cassette and CD entitled Redefined (by Clayton Aiken), and a CD that combined some songs from each of the previous demos: "Look What Love Has Done, Vol 2" (by Clay Aiken). Estranged from his abusive birth father Vernon Grissom and with his mother's and grandfather Alvis Aiken's permission, at the age of 19 he legally changed his surname from Grissom to his mother Faye's maiden name, Aiken. Aiken attended Raleigh's Leesville Road High School and took courses at Campbell University before enrolling at the University of North Carolina at Charlotte. In 1995, Clay started working at the YMCA. Still in high school, Clay learned quickly that he could make a difference in the lives of young people. He found his interest in special education while directing YMCA children's camps as a teenager, and at age 19, he served as a substitute teacher for a classroom of students with autism at Brentwood Elementary School in Raleigh. It was during that experience that he decided to finish college and become a special education teacher. While attending college in Charlotte, he took a part-time job as an assistant to a boy with autism, and it was this child's mother, Diane Bubel, who urged him to audition for American Idol. Although his American Idol activities temporarily delayed his academic pursuits, Aiken completed his course work while on tour and graduated with a bachelor's degree in special education in December 2003. On August 8, 2008, Aiken announced, on his personal blog, the birth of his son in North Carolina: "My dear friend, Jaymes, and I are so excited to announce the birth of Parker Foster Aiken." The child's mother, Jaymes Foster, is the sister of record producer David Foster, Executive Producer of Aiken's last three albums on the RCA label. "The little man is healthy, happy, and as loud as his daddy", Aiken wrote. "Mama Jaymes is doing quite well also." In his book, Learning to Sing: Hearing the Music in Your Life, Aiken said, "It's a Southern tradition to be given your first name from your grandmama's maiden name." Aiken's middle name came from his paternal grandmother's maiden name; he and Foster used the married surnames of their mothers to name their son. After several years of public speculation, Aiken came out as gay in a September 2008 interview with People magazine. In April 2009, Aiken was honored by the Family Equality Council advocacy group at its annual benefit dinner in New York City. On November 18, 2010, Aiken went to Washington, D.C., on behalf of Gay, Lesbian and Straight Education Network (GLSEN) at a Capitol Hill briefing talking about anti-gay bullying. Aiken was born into a Baptist family. As a toddler, in 1980, he attended Leesville Baptist Church every week. According to his book, Learning to Sing: Hearing the Music in Your Life, he was involved in Bible school, choir, and the youth group. The book made The New York Times Best Seller List in 2004, debuted at number two. It was written with Allison Glock and published by Random House. Barely mentioning American Idol, Aiken instead turned his focus to the people who had the most influence in his life – his mother, grandparents, siblings, teachers, and friends – and to the importance of religion in his life. He describes himself as a proud Southern Baptist who journeyed away from those roots in his late teens in search of a religion with more liberal social policies. He then returned to that church because of family and social ties although he remains at odds with the church on some issues. When asked in a PBS Kids interview to name his idols, he responded, "When people ask me what three people I'd like to have dinner with, living or dead, I say Jesus Christ, Mr. Rogers, and Jimmy Carter." Aiken had filled out an application to participate in the reality show Amazing Race when a friend of his insisted that he try out for American Idol instead. Television viewers first glimpsed Aiken during the audition episodes at the beginning of American Idol's second season. The show's judges first saw Aiken as a nerdy type unlikely to be a typical pop idol, but after hearing him sing Heatwave's "Always and Forever" decided to advance him to the next round. The clip of the judges' surprise during this audition performance was replayed many times over the course of the competition. Aiken made it to the round of 32 before being cut from the show, but he was invited to return for the "Wild Card" round; his performance of Elton John's "Don't Let the Sun Go Down on Me" sent him on to the final 12 as the viewer's choice. While noted for his performance of ballads, such as Neil Sedaka's "Solitaire", his upbeat performances, including The Foundations' "Build Me Up Buttercup", were also appreciated. Aiken received enough votes every week to keep him out of the bottom three. Part of his appeal was his "geek to chic" transformation in appearance. "I looked like Opie", Aiken said to People magazine regarding his appearance at his American Idol audition in 2002. He replaced his glasses with contact lenses and agreed to let the show's stylists change his hair style. With longer, flat ironed, spiky hair and a penchant for wearing striped shirts, Aiken had established a trademark look by the final American Idol season 2 show. On May 21, 2003, Aiken came in a close second to Ruben Studdard, who won the contest by 134,000 votes out of more than 24,000,000 votes cast. The result was controversial, as some hypothesized that Idol's voting system was incapable of handling the number of attempted calls. In an interview prior to the start of the fifth season of American Idol, Executive Producer Nigel Lythgoe revealed for the first time that Aiken had led the fan voting every week from the Wild Card week to the finale, when the possibly-random voting result gave Studdard the win. Rolling Stone featured Aiken on the cover of its July 2003 issue. In the cover article Aiken said, "One thing I've found of people in the public eye, either you're a womanizer or you've got to be gay. Since I'm neither one of those, people are completely concerned about me." In subsequent interviews he expressed frustration over continued questions about his sexual orientation, telling People magazine in 2006, "It doesn't matter what I say. People are going to believe what they want." Aiken made a surprise appearance on the final show of the fifth season of American Idol, when failed auditioner Michael Sandecki returned to the show to receive a "Golden Idol" award for Best Impersonator for his Clay Aiken-like appearance. Aiken appeared without introduction in a well-tailored designer suit and longer, darker hair with bangs, looking so different that many did not recognize him until he began to sing "Don't Let the Sun Go Down on Me." The second season of the American Idol Rewind series (2007) was narrated by Aiken. Clay is reportedly one of the top 10 earners of Idol, earning an estimated $1.5 million in 2010. ^Note 1 Due to Corey Clark's disqualification, the Top 9 performances became Top 8 when no one was eliminated. On October 14, 2003, Aiken released his first solo album, Measure of a Man, which debuted at number one on the Billboard 200, with 613,000 copies sold in its first week, the highest-selling debut for a solo artist in 10 years. The album received RIAA Double Platinum certification on November 17, 2003 (a Double Platinum plaque was presented to Aiken by Clive Davis on October 22, 2003, during Good Morning America). The album spawned both the hit single "Invisible" and his first hit song, "This Is the Night" (both co-written by British songwriter Chris Braide). Later that year, Aiken won the Fan's Choice Award at the American Music Awards ceremony, and his CD single "This Is The Night/Bridge Over Troubled Water" won the Billboard award for the Best-Selling Single of 2003. On November 16, 2004, Aiken released a holiday album titled Merry Christmas with Love, which set a new record for fastest-selling holiday album in the Soundscan era (since 1991). The album debuted at number four on the Billboard 200 and tied Céline Dion's record for the highest debut by a holiday album in the history of Billboard magazine. Merry Christmas with Love sold over 1,000,000 copies retail in six weeks and was the best-selling holiday album of 2004, receiving RIAA Platinum certification on January 6, 2005. Aiken's second studio album, A Thousand Different Ways, was released September 19, 2006. He worked on the album under the guidance of Canadian producer and A&R executive Jaymes Foster. The album contains ten cover songs and four new songs, one of which Aiken co-wrote. Clive Davis is credited with the cover concept. One additional song, "Lover All Alone", written by Aiken and David Foster, is included with the album on iTunes. Debuting at number two on the Billboard chart, A Thousand Different Ways made Aiken the fourth artist ever to have his first three albums debut in the Top 5 and scan over 200,000 in the first week. Aiken stated in an April 2007 interview with People that he was planning a new album, and during his May 2007 appearance on Jimmy Kimmel Live!, he mentioned that he was in Los Angeles interviewing producers for the new album. Aiken found a song, "On My Way Here", written by OneRepublic frontman Ryan Tedder, that struck a chord with him and became the inspiration for the album's theme in addition to the album title. For a cohesive sound, Aiken chose Mark 'Kipper' Eldridge to produce the entire album. On My Way Here was released May 6, 2008, on the RCA label. According to an article posted on Billboard, Aiken and RCA parted ways shortly after his On My Way Here album was released. Aiken's rep confirmed to People magazine that Aiken left RCA. Stated in the cited People article, "The buzz about Aiken's exit was fueled earlier this week when his picture disappeared online and Billboard, citing unnamed sources, reported Friday that Aiken, 30, had been dropped by the label. According to Billboard, Aiken's 2008 album "On My Way Here" sold just 159,000 copies in the U.S., compared to his 2003 debut album, "Measure of a Man", which sold 2.78 million copies". A fifth album, The Very Best of Clay Aiken, was released at the end of March 2009 on Sony's Legacy Recordings Playlist Series. This album was a compilation of songs that had been included on the previous albums released by RCA. First week sales of 3000 copies placed Playlist: The Very Best of Clay Aiken at number 173 on the Billboard 200 chart and at number ten on the Top Internet Albums chart. On August 10, 2009, it was announced on Aiken's official website that he had signed with Decca Records and he would have new music out by early 2010. Performing the songs from his new album, Tried and True, Aiken held a one night only concert at the Raleigh Memorial Auditorium in Raleigh, North Carolina on March 12, 2010. The concert, filmed for PBS broadcast, included guest appearances by Ruben Studdard and Linda Eder. Eder joined Aiken on stage for their duet of "Crying", which they recorded for his album. The album was released on June 1, 2010 and features songs popular in the 1950s and 1960s, including two Aiken covered during his run on American Idol, "Mack the Knife" and "Unchained Melody". In conjunction with the PBS special a companion DVD, Tried & True Live!, was released on July 27, 2010. A tour to promote the album is planned for early 2014. On December 20, 2011, Aiken released a new single, "Bring Back My Love" under the Decca Label. The single is his first original song since the release of his album On My Way Here in 2008. On March 27, 2012 Aiken released Steadfast, a new album of previous recordings and songs only sung in concerts. The album debuted at #120 on the Billboard 200 chart with sales of 4,000 in the first week. Aiken has made many television appearances. "We have someone here today from the smash hit show American Idol. We're thrilled to have him joining us today, because when it was made known that he would appear on this Telethon, the emails and the fan clubs that this young man has have sent us $30,000.00 just at the fact that he was here. And I can honestly say I have never, in all of my life, seen a theatrical groundswell that this kid has motivated, that it makes us all come right back to the bobby sox and Frank. And isn't it nice to live through that magnificence again? Here is Clay Aiken." That same year, Aiken sang "The Star-Spangled Banner" on the opening night of the 2003 World Series and appeared in numerous television specials during the winter of 2003, including Disney's Christmas Day Parade and the Nick at Nite Holiday Special, where he sang the "Little Drummer Boy/Peace on Earth" with Bing Crosby via special effects. Aiken starred in and executive produced his first TV special (December 2004), titled A Clay Aiken Christmas, with special guests Barry Manilow, Yolanda Adams, and Megan Mullally; the special was released on DVD later that month. On July 4, 2004, Aiken was one of the performers in the A Capitol Fourth concert in Washington, D.C. and performed in the Good Morning America Summer Concert Series in 2004 and 2005. He also sang "Isn't She Lovely" on the popular television show Scrubs. Aiken was the musical guest on Saturday Night Live in 2004 and participated in several skits. He has appeared multiple times on The Tonight Show, interviewing with Jay Leno as a guest in addition to singing, and has become a regular guest on Jimmy Kimmel Live!. The Kimmel appearances often feature skits: in one, Jimmy Kimmel's then girlfriend Sarah Silverman confessed to an affair with Aiken, and in another, Aiken expressed his distaste for Kimmel's jokes about him by beating him up. In May 2007, he spent the first half of his interview on horseback while talking about his recent UNICEF trip to Afghanistan. A few weeks later he appeared as a spokesperson for "Guillermo's Mustache" in Kimmel's fictional DVD informercial shown on the Dancing With the Stars finale. Aiken made his acting debut on Ed in early 2004, playing himself, and in 2005, he was interviewed by Erica Kane on All My Children. He played the role of cafeteria worker Kenny on the Scrubs episode "My Life in Four Cameras". In December 2006, he made an appearance as himself on Days of Our Lives. After hosting and performing in the American Idol Christmas special in 2003, Aiken has had several subsequent hosting jobs. He was a special correspondent for The Insider for the 2005 Emmy Awards, and on the sets of the sitcom Reba with Reba McEntire and Dancing With the Stars. He co-hosted The Morning Show with Mike and Juliet in 2006, and on November 17, 2006, filled in for Regis Philbin as guest host on Live with Regis and Kelly. During an interview, Aiken covered Kelly Ripa's mouth with his hand. The incident drew considerable media reaction after Ripa complained at length about the incident on her show the following Monday. Aiken made fun of the controversy on the 2006 American Music Awards the next night with Tori Spelling. On The Tyra Banks Show in 2006, filmed before the Ripa incident, Aiken mentioned wanting to have his own talk show someday, and Banks switched seats with him and let him interview her for one segment of the show. Aiken was a guest judge on the April 8, 2009 segment of Banks show America's Next Top Model; in what the show refers to as a teach, he worked with the remaining 8 contestants on their acting skills prior to the judging. In May 2009, Aiken made a guest appearance on 30 Rock in the season 3 episode "Kidney Now!." It was revealed in this episode that he is the cousin of the show's character Kenneth. In August 2010, Aiken guest starred in an episode of Phineas and Ferb, called "Phineas and Ferb: Summer Belongs To You!." Aiken sang an inspirational duet with Chaka Khan, to encourage those who did not believe that Phineas and Ferb could accomplish their goal of circling the globe faster than the sun, thus creating the longest summer day of all time. On January 30, 2011, Aiken sang the United States' national anthem at the 2011 NHL All-Star game held at the RBC Center in Raleigh, North Carolina, home of the Carolina Hurricanes. Recently, Aiken guest starred on the comedy drama series Drop Dead Diva. In 2012, Aiken was a contestant in the fifth season of The Celebrity Apprentice, and ended up losing to Arsenio Hall, becoming the runner-up. Aiken appeared in one of the last episodes of The Office, titled "A.A.R.M.". He played himself and was one of the judges for a reality show that Andy was auditioning for. In 2013, Aiken guest starred on an episode Law & Order: Special Victims Unit along with Taylor Hicks and Ashanti, playing themselves as judges for a singing contest on the episode called "Dissonant Voices." On January 18, 2008, Aiken made his Broadway debut when he joined the cast of Monty Python's Spamalot for a four-month run, ending on May 4, 2008. He played Sir Robin, in the Tony Award-winning musical directed by Mike Nichols. In addition to Sir Robin, Aiken played the 1st Guard and the Brother Maynard roles. On August 12, 2008, it was announced that Aiken would resume his role as Sir Robin beginning on September 19 and ending on January 4, 2009. On December 23, 2008, Aiken had his caricature unveiled at world-famous Sardi's restaurant. In May 2013, Aiken starred as "Man in Chair" in North Carolina Theatre's production of The Drowsy Chaperone, along with fellow Raleigh native and Tony Award winner Beth Leavel, who reprised her role as "The Chaperone." During the summer of 2013, Aiken performed the role of Joseph in the musical Joseph and the Amazing Technicolor Dreamcoat at the Ogunquit Playhouse in Ogunquit, Maine. From February through April 2004, Aiken and Kelly Clarkson embarked on the Independent Tour as co-headliners. Following this tour, he was scheduled for a few summer solo tour dates, but demand ultimately led to the booking of 50 dates across the United States, resulting in what many fans called the "Not-A-Tour". Disney (Buena Vista) was the exclusive sponsor of this unnamed summer tour, promoting their Aladdin Special Edition 2-Disc DVD with a preview of Aiken's rendition of "Proud of Your Boy", a song originally intended for the first release of the film but cut when the Aladdin storyline changed during production. A music video featuring Aiken is on the Aladdin Special Edition DVD. On this tour, he also performed a duet, "Without You", which was released on Kimberley Locke's 2004 debut album One Love. During the summer of 2005, Aiken, with a seven-piece band and three back-up singers, toured with the "Jukebox Tour", performing songs of the 1950s, 1960s, 1970s, 1980s, and 1990s, as well as a few favorites from Measure of a Man. He also performed a few new songs being considered for his next album. A 23-date tour in support of his third album, A Thousand Different Ways, began on July 4, 2007, and ended in Orlando, Florida, on August 19. On this tour Aiken hired local symphonies to back him, along with tour regulars Jesse Vargas, pianist, conductor and arranger; Sean McDaniel, drummer; and Quiana Parler and Angela Fisher, backup singers. Three days into the tour, Aiken and a woman were involved in an in-flight altercation in which she allegedly shoved him. As a result of the scuffle, Aiken and the woman were later questioned by the FBI. Aiken told ET that he had been sleeping when the incident occurred. His fourth annual Christmas tour, "Christmas in the Heartland", began on November 26, 2007, in Wichita, Kansas. That 21-date tour ended on December 22, 2007, in Merrillville, Indiana. Aiken and Ruben Studdard brought their "Timeless" tour to cities in the US and Canada beginning in Asheville, North Carolina, on July 23, 2010, and ending in Biloxi, Mississippi, on August 14. Instead of a concert focusing on each singers recordings, Aiken and Studdard opted for a variety show format covering medleys of songs from the 1960s to the 1990s with a few solos and interspersed with comedy bits. Aiken announced on July 30, 2010, that he will be touring in February and March 2011 in conjunction with PBS to support his album Tried and True and accompanying live DVD Clay Aiken: Tried and True – Live. Aiken began his fifth Christmas tour "Joyful Noise 2012" in Florida in November 2012. Aiken started at an early age to believe in a life of service. In 1995, Clay started working at the YMCA. Still in high school, Clay learned quickly that he could make a difference in the lives of young people. At 19, Clay taught at Brentwood Elementary School in a class of kids with autism. It was during that experience that he decided to finish college and become a special education teacher. Aiken has donated his time and his voice to multiple benefit events and concerts, including the 2004 Rosalynn Carter Benefit, the America's Promise Benefit, and Heather Headley's Broadway Cares/Equity Fights AIDS benefit, "Home", where he sang a duet with Headley. He was one of the celebrity readers for the Arthur Celebrity Audiobook (Stories for Heroes Series), which benefits the Bubel/Aiken Foundation (now the National Inclusion Project) and other charities, and served as spokesperson for the series. He was also a spokesperson for the 2004 Toys For Tots drive, and acted as an ambassador for the Ronald McDonald House Charities. Aiken worked with the Make A Wish Foundation to make one little boy's dream of singing on stage with Clay Aiken come true. In September 2006, Aiken was appointed to the Presidential Committee for People with Intellectual Disabilities by President George W. Bush. Appointees serve a two-year term; Aiken was sworn in September 14, 2006, by HHS Assistant Secretary for Children and Families Wade F. Horn, PhD In April 2008, Aiken told People Magazine that he was too busy to do as much as he would like, but "If there's something I can do remotely, I would've been happy to do it." While appearing in Spamalot, Aiken used his free time and celebrity to help raise funds for Broadway Cares/Equity Fights AIDS (BC/EFA) during their fund drives and auctions. In 2010, Aiken spoke out for gay rights at the Human Rights Campaign dinner in North Carolina. He also joined other celebrities in filming an educational video for Cyndi Lauper's web based Give a Damn campaign, a project of her True Colors Fund. In addition to UNICEF and his National Inclusion Project he is promoting GLSEN, the Gay, Lesbian and Straight Education Network as one of his causes on his official website. Aiken has been a dedicated advocate for education and for children's causes. His interest in autism issues led him, along with Diane Bubel (whose son Michael is diagnosed with autism and was tutored by Aiken), to found the National Inclusion Project (formerly the Bubel/Aiken Foundation), which supports the integration of children with disabilities into the life environment of their non-disabled peers. The Foundation runs summer camps which reflect its mission, and also presents Able to Serve awards to support the volunteer efforts of children with physical and mental disabilities. In July 2005, Raleigh's WRAL-TV reported on an internet campaign mounted by critics questioning how Aiken's foundation used its money. WRAL news hired an independent accountant who reported that program services totaled $920,000 in 2004—around 85 cents on every dollar donated—which is considered a solid percentage compared to other charities. CNN picked up the story, and Aiken appeared on Showbiz Tonight to provide details about the Foundation's programs. In late 2004, the Foundation was awarded a $500,000 grant by the US government to develop a K–12 model for inclusion in community service projects to be used in schools across the country. In addition, State Farm granted $1.5 million to the Foundation to help develop a primary education curriculum focused on teaching social and life skills through service to children of all levels of ability. On August 5, 2009, in an open letter from the founders, Clay Aiken and Diane Bubel stated "As we realized the impact the Foundation has already made, it became apparent that even bigger accomplishments could be on the horizon. To that end, we along with the rest of the Board decided that a new name for the Foundation would establish long-term credibility and stability. We sought a name that would signify the Foundation's position as a national leader on inclusion as well as recognize the Foundation's start and the efforts of its faithful supporters. After much thought and deliberation, we are proud to introduce the organization we co-founded as the National Inclusion Project." In March 2005, UNICEF sent Aiken to the tsunami-stricken Banda Aceh area to raise awareness of the need to restore education quickly to the children who survived this disaster. UNICEF sent Aiken on another mission in May 2005, to northern Uganda, to witness the plight of children called "night commuters", who flee the villages each night to sleep in streets and shelters in hopes of avoiding being kidnapped by the Lord's Resistance Army. He was sent to Kabul and Bamyan, in Afghanistan in April 2007, where he was able to spend time with children in their classrooms; he also visited a health center for women and children where he administered oral polio vaccinations to babies. He observed that Afghani children, after being forbidden for so many years by the Taliban regime to attend school, are eager to return to school now that they are once again allowed to receive an education. Aiken spent his 2007 Christmas in Mexico with the children affected by the floods in the states of Chiapas and Tabasco. In late June and early July 2008, UNICEF sent Aiken to Somalia and Kenya. In the 2014 election, Aiken was the Democratic Party's candidate for North Carolina's 2nd congressional district. He was defeated by incumbent Republican Party Congresswoman Renee Ellmers, 59 to 41 percent. Aiken was voted the Favorite Reality Star of 2003 by TV Guide readers and "the most-loved reality star of all time" in a TV Guide poll conducted in the summer of 2005. In February 2006, People magazine readers voted Aiken their "Favorite American Idol". While the origin of the term "Claymates" is unknown, Aiken trademarked the term. While in Los Angeles in September 2006 for a CD signing and appearance on Jimmy Kimmel Live!, Aiken talked with Jann Carl of Entertainment Tonight about the names various sub-groups have given themselves: "Claysians" (Asian fans), "Claynadians" (Canadian fans), "Clayropeans" (European fans) and "Claydawgs" (male fans). She then teased him about having his own "Clay Nation". At the CD signing, two young fans asked Clay to autograph their shoulderblades and then went to the local tattoo parlor to make them permanent; later that day on Jimmy Kimmel Live! they were brought on stage to show the tattoos. Although some of his fans have been criticized at times by the media as being obsessive, he defends the group as a whole. When Kimmel said to Aiken that his fans were "crazy", Aiken stated that they were merely "enthusiastic". In 2003, in anticipation of the release of Measure of a Man, fans all over the country decided to get together and hold parties to celebrate the release of the CD and purchase copies at midnight. In 2006, for the release of A Thousand Different Ways, release parties were held in more than 80 cities in the United States, Canada, and Singapore. 2003: Won – Best Selling Single of 2003 – "Bridge Over Troubled Water/This Is The Night"
↑ Moss, Corey. "No Love for 'Idol' Losers." MTV.com. Retrieved 2007-06-23. ↑ "Clay Aiken heads "Here" on next album." Reuters New York. (Billboard) March 25, 2008. 1 2 Decca Records – Clay Aiken Retrieved 2010-04-08 Archived April 9, 2010, at the Wayback Machine. 1 2 An open letter from co-founders Clay Aiken and Diane Bubel: Archived August 9, 2009, at the Wayback Machine. National Inclusion Project. August 5, 2009. Retrieved 2009-08-05 Archived August 9, 2009, at the Wayback Machine. 1 2 "Celebrity Ambassadors: Clay Aiken" US Fund for UNICEF website. 1 2 ACF Press Office – PCPID Appointments." Archived September 25, 2006, at the Wayback Machine. US Dept of Health and Human Services (2006). Retrieved 2007-06-22. Archived September 25, 2006, at the Wayback Machine. ↑ "Clay Aiken meets Monty Python." CNN.com. Retrieved 2008-02-05 (article archived). 1 2 Cox, Gordon (August 12, 2008). "Clay Aiken returning to Broadway: 'American Idol' vet to reprise 'Spamalot' role". Variety. Retrieved 2008-08-12. ↑ "Clay Aiken Already Facing Anti-Gay Rhetoric From Congressional Opponent". ↑ Jarvis, Craig (May 13, 2014). "Aiken victory confirmed as more details on Crisco's death emerge". The Charlotte Observer. Retrieved 2014-05-15. ↑ Jenkins, Colleen (October 23, 2014). "'American Idol' singer Clay Aiken seeks win in first political bid". Investing.com. Retrieved 2014-10-23. ↑ Lachman, Samantha (November 4, 2014). "Clay Aiken Defeated in 2014 North Carolina Congressional Race". The Huffington Post. Retrieved 2014-11-06. 1 2 Aiken, Clay (2004). Learning to Sing: Hearing the Music in Your Life. pp. 249–251. ISBN 1-4000-6392-2. ↑ Woerner, Tom (May 22, 2003). "Scouts Remember Fallen Veterans". The Dunn Daily Record. Retrieved 2006-04-07. ↑ Demo CD, "Look What Love Has Done Vol 2", track listing. last.fm. Retrieved 2007-06-21. 1 2 Aiken, Clay. "Learning to Sing: Hearing the Music in Your Life" (2004). pp. 133–134, ISBN 1-4000-6392-2. 1 2 Aiken, Clay. "Learning to Sing: Hearing the Music in Your Life" (2004), pp. 153–161, ISBN 1-4000-6392-2. ↑ Aiken,Clay. "Welcome to Our World" Archived January 3, 2010, at the Wayback Machine. Blog (Clay Aiken's Official Fanclub). August 8, 2008. Retrieved: August 8, 2008 Archived January 3, 2010, at the Wayback Machine. ↑ Associated Press. "Clay Aiken Is a Father" Archived March 11, 2011, at the Wayback Machine. News (theInsider.com). August 8, 2008. Retrieved: 2009-25-07. Archived March 11, 2011, at the Wayback Machine. ↑ Caplan, David (September 24, 2008). "Clay Aiken No More Secrets". People Magazine. Retrieved 2008-12-24. ↑ "Clay Aiken to Congress: Stop anti-gay bullying". Thegavoice.com. November 24, 2010. Retrieved 2013-07-02. ↑ October 2003. Retrieved 2007-06-24. ↑ Christian Music Planet staff (January 2005). "American Idol Christians". 2004 in Review. Christian Music Planet. Archived from the original on March 8, 2007. ↑ Argyakis, Andy. "Clay Aiken's Balancing Act." Christian Music Planet. January/February 2005. Archived, subscription required. ↑ Aiken, Clay. Learning to Sing: Hearing the Music in Your Life (2004), pp. 228, ISBN 1-4000-6392-2. ↑ Aiken, Clay. Learning to Sing: Hearing the Music in Your Life (2004), pp. 227–229, ISBN 1-4000-6392-2. ↑ Bronson, Fred. The Billboard Book of Number 1 Hits. Billboard Books. ISBN 0-8230-7677-6. ↑ "People Photo Album, Then and Now". Retrieved 2007-05-24. ↑ Cooper, Chet. "Interview with Clay Aiken." Ability Magazine. Retrieved 2007-05-24. ↑ Seibel, Deborah Starr. "American Idol Outrage: Your Vote Doesn't Count." Broadcasting & Cable. May 17, 2004. Retrieved 2006-04-08. ↑ Martin, Logan. "It's Going to be a Very Strong Season, I Think: An Interview with American Idol Producer Nigel Lythgoe." Archived February 17, 2012, at the Wayback Machine. Reality News Online. January 17, 2006. Retrieved 2006-04-08. Archived February 17, 2012, at the Wayback Machine. ↑ Hedegaard, Erik and Jenny Eliscu. "New kid on the block." Rolling Stone. New York. July 10, 2003. Iss. 926; pg. 40. ↑ Tauber, Michelle. "Clay Aiken Facing the Music." People. New York, October 2, 2006. Vol. 66, Iss. 14; pg. 122. ↑ "Clay Aiken Biography: An Idol Returns." People. May 24, 2006. Retrieved 2007-05-24. ↑ "People Photo Album, Clay Aiken 2006." People. Retrieved 2007-05-24. ↑ "Top earners from "American Idol"". Abc2news.com. July 25, 2011. Archived from the original on October 11, 2013. Retrieved 2013-07-02. ↑ "New Releases, Sept. 19: Elton John, Clay Aiken, Diana Krall" Archived May 14, 2010, at the Wayback Machine. liveDaily.com. September 18, 2006. Retrieved 2009-07-25. Archived May 14, 2010, at the Wayback Machine. ↑ Bliss, Karen. "Aiken and Canadian Producer See Eye to Eye." JAM! November 7, 2005. Retrieved 2006-04-08. ↑ "Clay Aiken Album 'A Thousand Different Ways' Debuts at Number 2 on Billboard Album Chart With Sales Over 205,000." PRNewswire. September 27, 2006. ↑ Richards, Constance. "Clay Aiken: 'Idol Is a Drug'." People April 3, 2007. Retrieved 2007-04-13. ↑ Cohen, Jonathan. "Clay Aiken Heads 'Here' On Next Album." Billboard. March 21, 2008. Retrieved 2008-03-21. ↑ Clay Aiken Parts Ways With RCA Billboard. by Shirley Halperin. February 20, 2009. Retrieved 2009-02-20. ↑ Clay Aiken Leaves His Record Label People. by David Caplan. February 20, 2009. Retrieved 2009-02-20. 1 2 Graff, Gary. Clay Aiken Ready For Tour, Would Return to 'Idol' As Judge Billboard. June 23, 2010. Retrieved 2010–06–23. ↑ Mansfield, Brian (April 4, 2012). "McCreery's 'Clear as Day' takes the top 'Idol' album spot". USA Today. Idol Chatter. Retrieved 2013-12-15. ↑ Serpe, Gina. "Ripa Rips Clay; Rosie Responds." eonline.com. November 21, 2006. Retrieved 2006-12-17. ↑ "The Z List : This Week's Biggest Losers." TMZ.com. November 25, 2006. Retrieved 2006-12-17. ↑ "People Photo Album, Comic Relief." People.com. Retrieved 2007-05-24. ↑ "NBC Universal Media Village (May 14, 2009). 30 Rock " 05/14/09 9:31 pm" NBC Universal Media Village Retrieved 2009-05-19. ↑ "TV highlights: Friday, Aug. 6, 2010" The Washington Post. Retrieved 2010-08-08. ↑ Gabrielle Bonghi. "Santigold, Clay Aiken & Aaron Rodgers to make cameos on 'The Office'". Philly.com. Retrieved 2013-07-02. ↑ Anna Taberski. "Law and Order: SVU' Season 15, Episode 7 Recap: Almost Like 'American Idol,' But With Terrible Crimes". Huffpost TV.com. ↑ Blank, Matthew (December 24, 2008). "PHOTO CALL: Clay Aiken Honored with Sardi's Caricature". Playbill.com. Archived from the original on December 27, 2008. Retrieved 2008-12-24. ↑ "Archived copy". Archived from the original on June 9, 2013. Retrieved 2013-08-18. 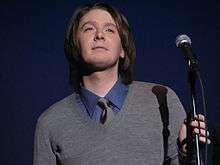 ↑ Clay's Aiken's tour sponsored by Buena Vista United Press International, July 10, 2004. Retrieved 2009-08-20. Archived October 19, 2013, at the Wayback Machine. ↑ "American Idol's Biggest Winners." Forbes.com. January 15, 2007. Retrieved 2007-06-21. ↑ "Popularity Contest." The Wall Street Journal. June 22, 2007. Retrieved 2007-06-22. ↑ "Aiken apparently questioned after airplane incident." Tulsaworld.com. July 2007. Retrieved 2007-07-09. ↑ "Clay Talks to ET About Airline Drama." ET.Com July 9, 2007. Retrieved 2008-01-12. Archived February 5, 2008, at the Wayback Machine. ↑ "Heather Headley: Home." Archived April 26, 2012, at the Wayback Machine. broadwayinspirationalvoices.com Retrieved 2009-08-05. Archived April 26, 2012, at the Wayback Machine. ↑ John's Wish Archived January 4, 2009, at the Wayback Machine. Make-A-Wish Foundation of Philadelphia & Susquehanna Valley. Retrieved 2009-01-10. Archived January 4, 2009, at the Wayback Machine. ↑ "Clay Aiken Defends His Busy Schedule." People. April 24, 2008. ↑ Broadway Bears Raises $127,000 for BC/EFA; Spamalot Bear Is King Archived August 29, 2008, at the Wayback Machine. Playbill, by Andrew Gans, February 19, 2008. Retrieved 2008-12-27. ↑ BC/EFA's Broadway Flea Market & Grand Auction Raises $496,380 broadway world.com, by BWW News Desk, September 22, 2008. Retrieved 2008-12-27. ↑ "Clay Aiken – Gay Rights Stand for American Idol Singer". National Ledger. March 1, 2010. Retrieved March 3, 2010. ↑ "Aiken and Cho Fight Against Harassment". The Advocate. May 21, 2010. Retrieved June 8, 2010. ↑ "Clay Aiken finds comfort in old songs, new life". Fayetteville Observer (AP). June 10, 2010. Retrieved September 28, 2010. ↑ Clay Aiken's Foundation Becomes The National Inclusion Project newswiretoday.com. Press Release. August 20, 2009. Retrieved 2009-08-20. ↑ National Inclusion Project, "Let's ALL Play." Retrieved 2009-08-06. Archived August 9, 2009, at the Wayback Machine. ↑ "Youth Service America, Partners & Sponsors." Retrieved 2006-06-23. Archived May 24, 2009, at the Wayback Machine. ↑ "Clay Aiken's Nonprofit Group Comes Under Critic Scrutiny." WRAL.com. July 18, 2005. Retrieved 2006-06-23. ↑ "Showbiz Tonight transcript." Archived August 20, 2014, at the Wayback Machine. CNN.com. July 25, 2005. Retrieved 2006-06-23. Archived, subscription required. Archived August 20, 2014, at the Wayback Machine. ↑ US Fund for UNICEF website, Aiken page. ↑ "UNICEF Goodwill Ambassador Clay Aiken visits Afghanistan." unicef.org. April 18, 2007.. Retrieved 2007-04-18. ↑ "Mexico flooding affects '700,000'." BBC News. November 1, 2007. Retrieved 2008-01-05. ↑ "(In the Field) Christmas Greetings from Clay Aiken in Mexico." unicef.org. December 25, 2007. Retrieved 2008-01-05. ↑ Mohamed, Guled. "U.S. pop star appeals for world attention on Somalia." Archived December 21, 2008, at the Wayback Machine. Reuters South Africa. June 25, 2008. Retrieved 2008-06-29 Archived December 21, 2008, at the Wayback Machine. ↑ Bonner, Lynn. US Congress: Ellmers takes big win over Aiken; GOP's Rouzer, Walker also win, Charlotte Observer, November 4, 2014. ↑ "North Carolina Official General Election Results". North Carolina State Board of Elections. November 4, 2014. Retrieved January 23, 2015. ↑ Ryfle, Steve. "Is There Life After 'American Idol'." Archived May 26, 2007, at the Wayback Machine. Netscape Celebrity. Retrieved 2007-09-15. ↑ "Clay Aiken: A Day In The Life!" Entertainment Tonight video interview with Jann Carl. Air date: September 28, 2006. Retrieved 2007-06-06. ↑ "obsessive fans make Clay want to quit." realityblurred.com. November 15, 2004. Retrieved 2006-04-05. ↑ Lazzaro, Stephanie. "Fans' most anticipated album worth all nighter." Archived February 21, 2008, at the Wayback Machine. nineronline.com. October 23, 2003. Retrieved 2007-06-21. Archived February 21, 2008, at the Wayback Machine. ↑ "Clay Aiken Album 'A Thousand Different Ways' Debuts at Number 2 on Billboard Album Chart With Sales Over 205,000." top40-charts.com. September 28, 2006. Retrieved 2007-06-21. ↑ Kam,Nadine. Idol's hold grows into his own ‘Clay Day’ Honolulu Star Bulletin. October 10, 2003. Retrieved 2009-08-05. ↑ "Caregiver Newsletter Issue #220. ", Caregiver.com April 21, 2005. Retrieved 2006-11-25. 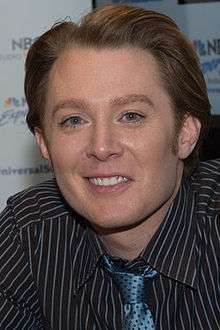 Wikimedia Commons has media related to Clay Aiken.